The PLCE Other Arms Rucksack has been on general issue to all non-infantry units for many years, and have a proven durability to carry heavy loads in arduous conditions around the world. 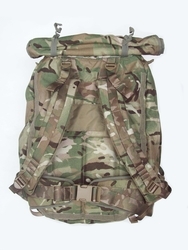 Classic travel bag style with padded shoulder straps and waist belt to carry it on foot, but these fold away behind a Velcro back panel to streamline it and make it more like a holdall for stowing in armoured vehicles, in aircraft holds etc. Removable internal frame made from lightweight aluminium. Large 80 Litre capacity which side zips to allow the attachment of standard PLCE side pouches, (NOT INCLUDED) if required to increase carrying capacity. Main compartment is secured with a two way chunky zip, covered by a strong Velcro storm flap to keep out rain or dust. Large grab handles at the top of the pack for when carrying it like a holdall.